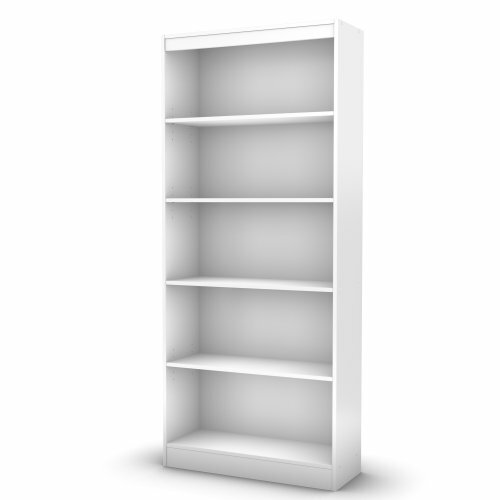 Ideal for your binders, books or decorative items, this versatile 5-shelf bookcase can meet all your storage needs. Both functional and attractive with its sleek contemporary styling, this bookcase is sure to enhance the look of any room in your home. Features 5 open, practical and accessible storage spaces, separated by 1 fixed shelf that can support up to 25 lb and 3 adjustable shelves that can support up to 15 lb. Features 5 open, practical and accessible storage spaces, separated by 1 fixed shelf and 3 adjustable shelves. Shelf #1 dimensions: 26.625'' (L) x 11.375'' (D). Accessories not included. Requires complete assembly by 2 adults (tools not included). 28'' (W) x 11.5'' (D) x 68.75'' (H). Box dimensions: 74.764'' (L) x 12.204'' (W) x 4.606'' (H), 71 lb. Packaging tested and certified to reduce the risk of damage during shipment. Made in North America with non-toxic laminated particleboard. 5-year quality guarantee. Any questions? Contact South Shore, the manufacturer, available 7/7 by phone, email or chat.